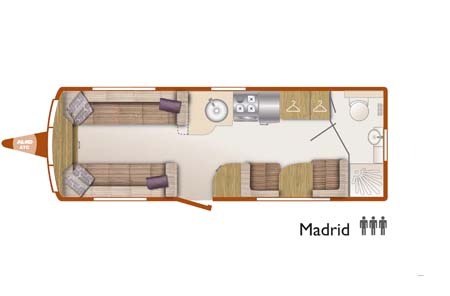 The new Unicorn Madrid certainly has that design tweak that will catch people’s eyes as it is a three berth model, with end washroom, a side kitchen with a side dinette and front living/sleeping area. It was the side dinette that drew us in to the caravan in the first place. The side dinette is designed for comfortable using and living but can be a bed if required although the consensus of thoughts are that Madrid will be used by couples who occasionally take a child or third adult away with them. The floor space is such, due to re-designed interiors giving up to 15% more floor space compared with previous Unicorn models, that even with three people on board it’s unlikely to be cramped. The table was wider than we expected and has a softly curved edge. Add in overhead lockers and a large window it’s somewhere you could comfortably chill out. The off-side kitchen, conveniently placed is well equipped and features the new, and exclusive to Bailey, Dometic 133 tower fridge with electronic ignition. 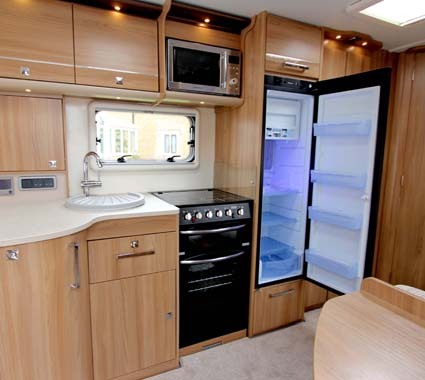 It’s a huge step forward in caravan fridge design and is very like a fridge in a modern kitchen. The radiator and hot water system, Alde Hydronic Compact 3020 with a programmable touch screen control panel, has been upgraded with improved air flow to improve the economy of the heating performance and there is now a panel radiator in the washroom. Washroom space has increased over previous models and now sports a fully lined squarer shower cubicle with a neat shelf and a door that swings out; I was about to give this door a black mark, thinking “wet door drips onto floor” when a quick thinking designer, one of Bailey’s new recruits, pointed out the small drainage channel in the bottom of the door which drains the drips back into the shower tray. Living and dining is in a bright and light space with the vertical skylight allowing in copious amounts of light and by night with task and mood lighting. 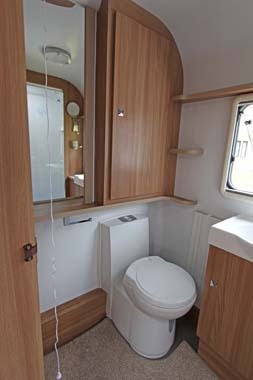 The storage space throughout the caravan is more than adequate. The new “Mendip Ash” furniture finish with Italian designed overhead locker doors blends well with the sumptuous soft furnishings; the standard scheme is Kensington but there is the Trafalgar option which costs an extra £199; we think that Kensington will be the most popular over the year. The side dinette cushions have been specially designed to be more armchair style and offer a high level of comfort. The Unicorn Madrid’s Green credentials include a roof mounted 100w solar panel, LED lighting and an Ecocamel water saving shower head. As you’d expect, the new Polar white body shell with awning channels on both sides is Alu-Tech and the construction method meets the stringent EN1645 Grade III classification for heating and thermal insulation; this is measured in a cold chamber. Safety and security features are many as Unicorn Madrid has AL-KO ATC trailer control system, AL-KO AKS Stabiliser, Al-KO Octagon Shock Absorbers; Al-KO Secure portable wheel lock, TRACKER Retrieve, WSL Caravan Wheel Safety Bolts, a new high security one key operation and TyrePal TPMS ready factory-fitted sensors (owners will need to buy a monitor if they choose to use this facility). Some of these devices offer great Caravan Guard insurance discounts too! 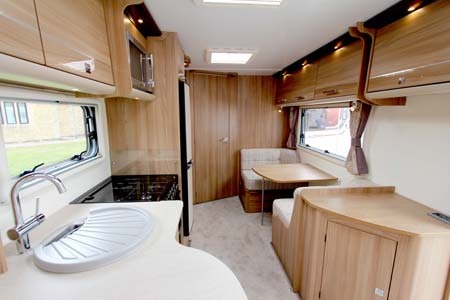 A novel layout, top-of-the-range, stylish, ideal for a couple; cracking price and specification with an up-market soft furnishing commensurate with current high street trends. You could leave the front bed or beds made up and you still have a very comfortable fully sprung seating area for relaxing. The floor space seems cavernous and there is plenty of storage space but remember your payload and what it includes! 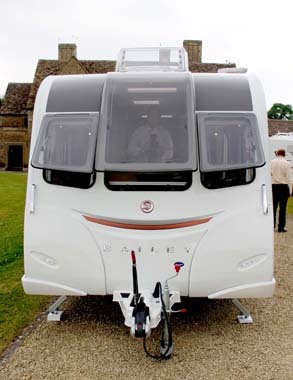 *Caravan insurance cost based on Bailey Unicorn Madrid caravan retailing at £20,645 fitted with hitchlock, plus standard fit axle wheel lock, Tracker Retrieve, alarm and anti-snaking device. Kept on drive at HX4 0BE. Caravanners over 30 years old, claim free for 3 years and a member of a caravanning club. £100 excess. 180 days European cover and up to £75 per day for up to 15 days emergency accommodation cover included. Legal expenses cover, extended European cover and other emergency accommodation expenses cover options are available at extra cost. Quote includes 10% online discount and 6% Insurance Premium Tax and is correct as of 20/08/2014 . **Price is ex-works and includes VAT but excludes a recommended delivery charge of up to £565 to cover the cost of additional services e.g. delivery of the caravan to your retailer, before collection by you. Thanks Bernie. We’ll ask the question for you. looking for a new van, tow car is being downsized as it is a company lease vehicle, but I love my 2011 Barcelona. I would not be happy using the kitchen flip-up worksurface as when it is in use it is in conflict with the arm of the adjacent seating area. Without it the worksurface provision is indequate. I’m in the market for a new Caravan to replace my Senator Wyoming but struggle to find a better alternative with the layout we have for long European touring. There are just the two of us but a fixed bed is a must for us. Good luck with the search for the new caravan. 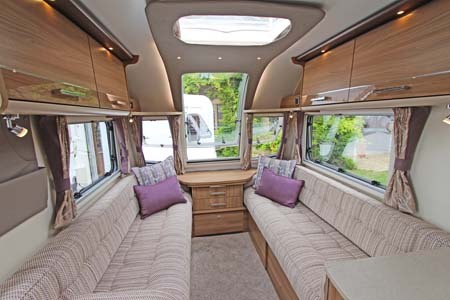 Have you taken a look at the new Sterling Continental or Swift Elegance? The 570 model in these two seems to have the same layout as the Bailey. Also Lunar Delta RS, Coachman Laser 640, or Compass Rallye 634 maybe? Well John It’s obvious you do not use a cl sites with no shower rooms. We use us our shower all the time and know many many more caravanners like us. would hate to go back to the days before showers where fitted. Looks good – light and airy and I like the pull out extra work surface. Fridge looks a bit big considering on 3 berth. 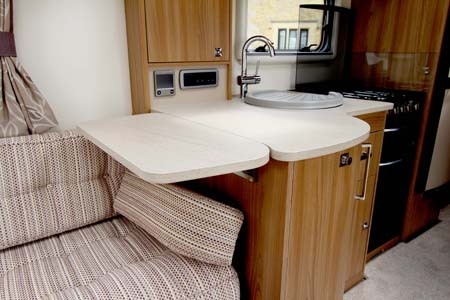 Worst bit – no curtain round the 3rd dinette bed. When will Bailey finally realise that kids need it a bit dark to go to sleep ? Not good…….